Location: The Mile High City Well, let's try out a new sticky-thread. I am not sure just how this will work, but you are welcome to post any non Forward Look items pertaining to the Rocky Mountain Region here. If you make a new post here, you may want to change the Subject line accordingly. Otherwise, a reply should show the same subject. For example, I ran across this De Soto on craigslist. 1939 was a great year for Chrysler products! The sedans don't quite look as appealing! Location: NY & VT Always liked the late '30s Deco styled Mopars, that sedan would be very tempting if space and money permitted, even the sedans have a sort of "black lab" doggy kind of friendliness and ruggedness about them! Great idea to post these!! these going down the road in original appearance ? Location: The Mile High City I went out to check on a 1961 Dodge (see thread in eBay section) and took a few snapshots of the cars this fellow had out in the yard. I have one of the rarest desotos ever built this is one 2200 coupes but one or 437 custom coupes. This car does need complete restoration I do have a 46 4 door sedan that is parts for this car for dash parts and some interior parts too. will ship car if needed , I will take a reasonable offer no low balls call 505 239 2588 for more info thanks Video of car can be seen on youtube under moparmenis. Chrysler Imperial Custom Coupe. "The finest car in America today!" That was the sales byline for the new 1954 Imperial by Chrysler. You may not find a better example than the car that I'm offering. This is an extremely rare "Matching Numbers" car. It was painstakingly restored to factory original condition. The car was repainted in it's original colors of Tahitian Tan over Cordovan Brown Metallic. The color-matched interior is new and flawless. All the chrome has been freshly replated--$$$. It took five months to completely rebuild the 331 cubic inch Hemi engine. The transmission was removed, overhauled and resealed. All component parts-- starter, generator, power steering box, air conditioning compressor, battery, voltage regulator, etc are either new or freshly overhauled. The "Break-In" oil was literally just changed. It's still six volts! Old parts were saved. At a cost of $4,560.00, before the Dealer added A/C, this was one of the most luxurious and expensive cars in America in 1954. All systems are in perfect working condition. Save the clock, all electrical and mechanical instruments work flawlessly. You simply will not be disappointed in the looks, feel, ride and quality of this low miles, Hemi-Headed Luxury Cruiser. I have a book full of receipts evidencing the thoroughness of the restoration. you may not think you are interested, but there is plenty to see in the pictures! Location: The Mile High City This one must have been sold. I will post the pictures. A neat looking De Soto Adventurer in the background and it looks like it came with a Highway Hi-Fi! The lucky new owner came up with some good stuff! Location: The Mile High City Not mine! Location: Lower Mainland BC This? Location: The Mile High City That's the one! 1930 Chrysler Business Coupe in Montrose, CO $7,000 - not monkeyed around with! This afternoon, I tried to get an image of the Colorado State Capitol and Immaculate Conception from Colfax and about Williams. The old Mountain States Bank was at Colfax and Gilpin. I was at ground level. For the life of me, I can't figure out how they took the image Joe sent to me! Location: Colorful Colorado skier on the license plate Mike, The photographer was a block east and standing in the right lane, and the camera was pointed a little more to the west. At least a block east! I think the photographer must have been many, many blocks east with a zoom lens. There were only a few buildings I recognized, but the house with the gable-end brown roof is one. Also the building with the high hipped roof corners. I can't figure out how the photographer got the house with the brown roof to line up with the state capitol and was able to get those proportions! When I went out there thinking I could get a similar shot, I just don't see how the angle exists! If you could get the house with the brown roof and the state capitol closer, it seems like the state capitol would be tiny! Maybe it was some different type of lens like a zoom or fish-eye or ??? I did actually take the image a block east of Mountain States, like you might think from Joe's photograph. Here is the un-cropped image with the reference points in yellow. Somehow that image above was far enough away that all of the reference points on the south side of the street lined up a bit better. Now the pot billboard would probably obscure the state capitol building! Location: Golden, CO Just noticed this Non-Forward Look thread and thought I'd post a few photos of my 53 Dodge Coronet convertible. Originally a Denver car, I bought it about nine years ago from the family of the original owners. One of 4,100 produced and an early build, it is one of the oldest, and possibly the oldest, Dodge hemi convertible still existing. It's never been restored and still has its original interior, top & 90% of paint, plus of course, original driveline & most options then available. And if you look real close, you can see a vestige of fin on each rear fender. Nice Dodge. We (at least I) could handle some more photos, e.g. interior, engine bay, etc. Fantastic Rich! I’ve seen it a few times at the Colorado MoPar show. Great to see it here! Location: Golden, CO A few more photos. Any idea where that DODGE V EIGHT air scoop goes? The brochures said it fed cool air directly to the carburetor. Maybe. Location: Golden, CO There is a chute built into the underside of the hood that directs air to the air cleaner. Sorry I don't have a picture & the car is not at home to take one. Interesting that the ad you posted talks about the 6 cylinder engine, but not the Red Ram V8 which is pictured in the chassis. There is a chute built into the underside of the hood that directs air to the air cleaner. Sorry I don't have a picture & the car is not at home to take one. I would love to (eventually) see a photo of that chute. 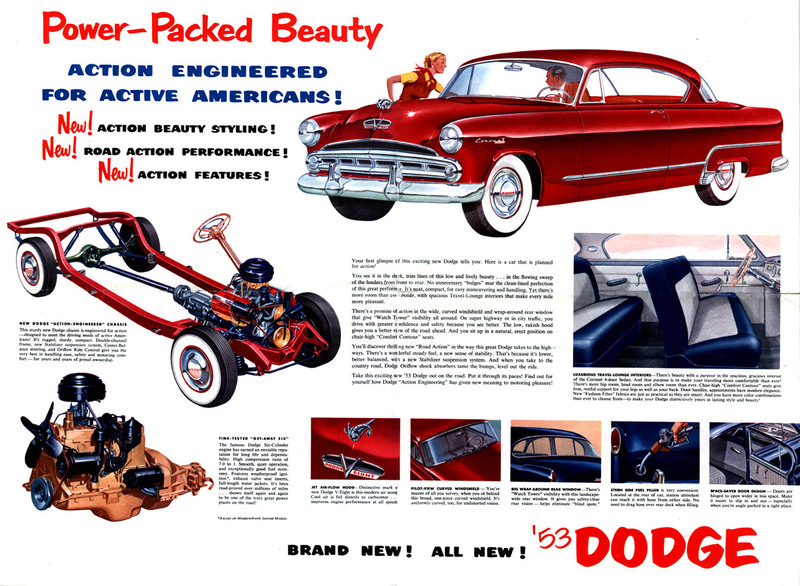 I was thinking of doing that to my 56 Dodge but didn't know how the factory did it in 1953/54. So I did something else.